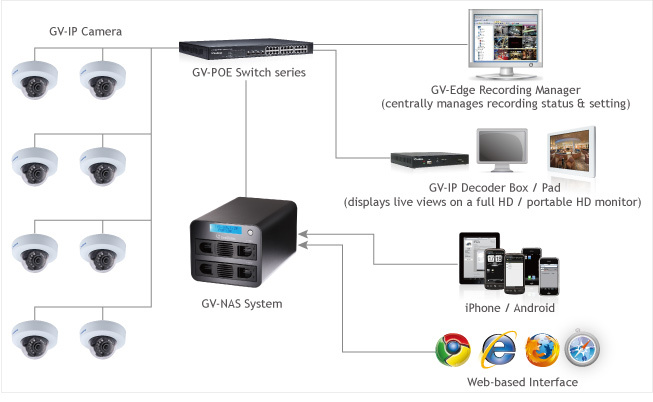 The GV-NAS System is a Linux-based, network-attached storage device designed to store GV-IP Camera recordings. The GV-NAS System features RAID to ensure data security, rendering data recovery possible. Allowing access from multiple users over multiple platforms (mobile devices and desktop), user accessibility is customizable, keeping your data accessible and secure at the same time. Management over a mass number of GV-IP Cameras is made easy with GV-Edge Recording Manager, which provides an integrated interface where you can assign recordings to the designated folder in GV-NAS Systems. Note:: GV-NAS2008 is designed for 3.5" hard drive disks (2.5" models are not supported), each at the maximum of 4 TB (future upgrades may allow for higher capacity HDDs). 1. The maximum numbers of recording channels are based on 5 minute recording interval, default recording quality setting (Good) and a constant bitrate of 6 Mbit at maximum. 2. Automatic RAID creation refers to automatic creation of RAID array based on the number of inserted hard disks. 3. RAID migration refers to re-establishment of a RAID array to another RAID level by adding or removing hard disks. 4. RAID expansion refers to creation of more RAID array by adding one or more hard disks. Note:GV-NAS2008 supports automatic system startup (at power resumption) using a hardware DIP switch. Note: Specifications are subject to change without prior notice. GeoVision - How long will my login remain valid? GeoVision - Cannot login to the FTP server GeoVision - My download is slow, what can I do? GeoVision - How do I download from USAVision FTP site? GeoVision - Top 10 Technical Support Requests GeoVision - How Do you Grant Domains Local Admin Privileges GeoVision - TeamViewer 7 with Geo Logo / HQ WebSite GeoVision - How do I download and install TeamViewer? GeoVision - FAQ Index GeoVision - What are the hours for online chat support? GeoVision - Suggested PC Motherboard/CPU list - Updated: 08/26/2013 GeoVision - Computer Motherboard Compatibility with Combo B cards GeoVision - GV-NVR PC Requirements GeoVision - GV-Hybrid (Analog + IP) PC Requirements GeoVision - Determining if you are having POE switch issues Geovision - System Hard Reboot Issues? GeoVision - How to set NVR Lite V2a to auto reboot after power loss GeoVision - How do I format a new hard drive (smaller than 3TB)? GeoVision - What is the power consumption for GeoVision capture cards? GeoVision - How do I format a new hard drive (bigger than 3TB)? GeoVision - USB Dongle Specifications GeoVision - GV3008, GV4008A, and GV5016 Comparison GeoVision - How do I install GV-4008A? GeoVision - How do I install GV-3008? GeoVision - How do I install Multi-Quad Card and Loop Through Card? GeoVision - DVI-Type Hardware Installation GeoVision - D-Type Hardware Installation GeoVision - Will I lose my license during the dongle upgrade process? GeoVision - Technical Notice: ATI Graphic Card Driver Issues GeoVision - How do I install Net I/O Card? GeoVision - How do I install GV-900A? GeoVision - How do I install GV-600B/650B/800B? GeoVision - How do I connect and setup NVR Lite? GeoVision - Multicam Training Video GeoVision - Bandwidth/Disk Space Calculator GeoVision - How do i View I/O Input/output events on my system? GeoVision - Connection failed.Limited by USB key Error for Geo Cameras GeoVision - How do i send a scheduled e-mail alert on the system? GeoVision - Is there a time lapse or snapshot feature in Multicam? GeoVision - How to perform a deep uninstall of MultiCam? GeoVision - IP Device Utility does not pickup any IP camera during scan GeoVision - How do I record video (selected cameras) by input trigger? GeoVision - How do I record video (all cameras) by input trigger? GeoVision - Which video analytics are included with AVP dongle? GeoVision - How do I change Multicam software resolution? GeoVision - Which PTZ cameras/protocols are compatible with GeoVision? GeoVision - How do I setup E-mail alert using a GMail account? GeoVision - Keylock Guide GeoVision - How do I exit Keylock utility? GeoVision - How do I setup input trigger to be overlaid on screen? GeoVision - How to remove mosaic masks in Viewlog? GeoVision - Which third-party PTZs support Object Tracking? GeoVision - How do I install driver for v6.05 or older version? GeoVision - How do I remove supervisor accounts? GeoVision - How do I setup spot monitor? GeoVision - How do I setup video analytics? GeoVision - Video Analytics: How to Counter Setup GeoVision - Video Analytics: How to Intrusion Alarm GeoVision - Video Analytics: How to Face Detection Setup GeoVision - Video Analytics: How to Unattended Object Detection Setup GeoVision - Video Analytics: How to Missing Object Detection GeoVision - Video Analytics: How to Scene Change Detection Setup GeoVision - Error: "Out of memory..." GeoVision - How do I disable video lost beep? GeoVision - How do I reset password? GeoVision - Green screen in video playback GeoVision - Pink screen in live view GeoVision - Error: "Cannot find key pro" GeoVision - How do I adjust video resolution for analog cameras? GeoVision - Analog image resolution is too small GeoVision - Adding analog cameras but missing check box GeoVision - No Video on Some Channels with Geovision Logo? GeoVision - How do I listen to audio in Multicam? GeoVision - How much disk space do I need for my cameras? GeoVision - Adding a new partition / hard disk for recording GeoVision - How do I enable audio recording in Multicam? GeoVision - How do I setup auto reboot? GeoVision - How do I setup System Idle Protection? GeoVision - How do I use digital zoom (PIP/PAP)? GeoVision - How do I setup camera scan? GeoVision - How do I setup manual/schedule recording? GeoVision - How do I setup System Log? GeoVision - Error: "You may be a victim of counterfeit..." GeoVision - Error: "Create direct sound failed" GeoVision - Error: "Direct draw overlay failed" GeoVision - Error: "No new entry will be added..." GeoVision - Error: "Disk Space Low, Recycle Empty" GeoVision - Question mark "?" on Viewlog GeoVision - How do I perform database repair in Viewlog? GeoVision - How to back up video with Viewlog? GeoVision - How do I perform system recovery on GV-DVR/NVR system? GeoVision - How do I setup schedule in Multicam? GeoVision - How do I setup password database? GeoVision - How do I setup video storage location? GeoVision - How do I setup PTZ in Multicam? GeoVision - Example of how to setup a PTZ camera GeoVision - How to setup PTZ Idle Protection for auto touring GeoVision - How do I setup e-mail alerts in Multicam? GeoVision - How do I setup an analog camera in Multicam? 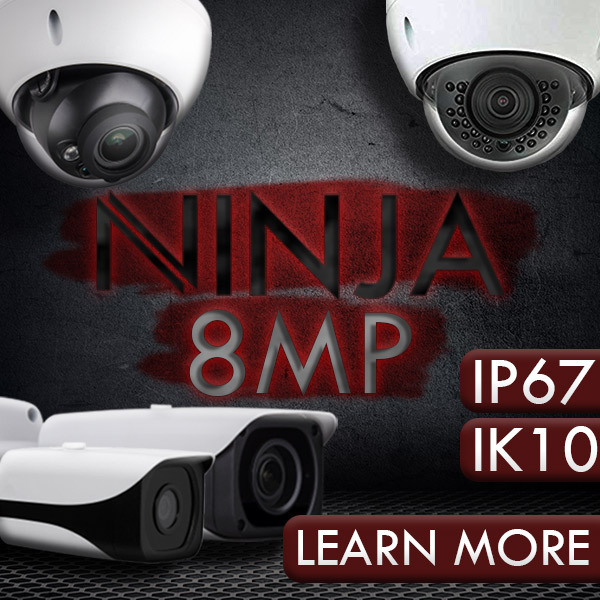 GeoVision - How do I setup an IP Camera in Multicam? GeoVision - How do I backup video files onto external hard drive or DVD? GeoVision - How do I perform software upgrade? GeoVision - How do I know which Multicam software version I am using? Geovision - How to set up hot SWAP NVR for RAID? Geovision - Areconte 20185 / encoder problem with Recording Server Geovision - Where can I find version history for each GeoVision update? Geovision - How many IP Cameras can I connect to GV-NVR? Geovision - Which PC components are compatible with GeoVision card? Geovision - Is my GeoVision card compatible with Windows 7? Geovision - Is my GeoVision card stackable? Geovision - Which OS/software version is compatible with my GV card? Geovision - Where do I find the barcode of GeoVision Capture Card? You must provide Worldeyecam, Inc with the Confidential Dealer / Reseller Application Form information. Dealer LOGIN account will be created to display special discounted prices as an Worldeyecam Dealer/Distributor. You will be able to login and create quotes or simply order products at your discounted rate. WorldEyeCAM, Inc. will add your business into our database of nationwide integrators and installers. WorldEyeCAM, Inc will provide 1st Class Factory Trained technicians to provide fanatical technical support. WorldEyeCAM, Inc. will advertise and promote your company on that we are partnered with installers that work in the area (cities and counties) that you service and cover. When we get request for installation services in the area that you service, we will refer the customer to you for installation and sales. Please fill out the below form and one of our Security System Expert will contact you by phone or email within 24 hours or the following business day.